Undulating edges of this ring come together to hold a brilliant white diamond at the centre – a lovely alternative engagement ring or wedding band. We thought you would like to know has been eyeing up our 14k Rose Gold Trio Ring for some time now and has requested we bring it your attention. What's your question about 14k Rose Gold Trio Ring? 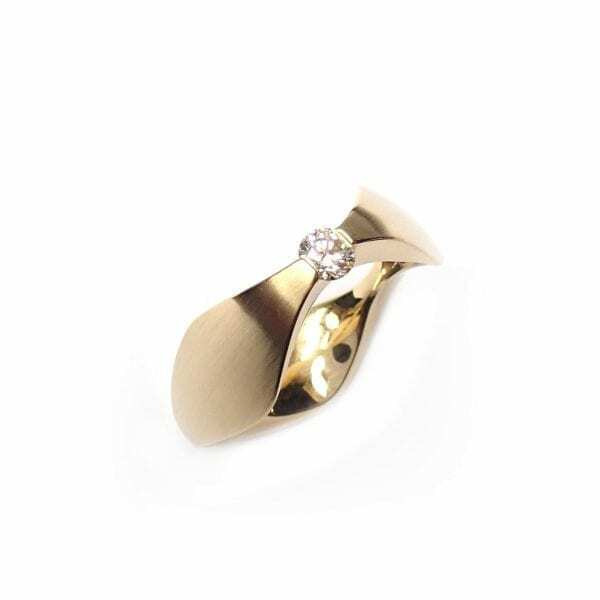 The simple yet stunning Trio ring is made in 14k rose gold. It has a unique scalloped shape and is set with a sparkling round brilliant cut diamond (0.05ct, G colour, VVS clarity). It is a beautiful choice for an engagement ring or a right hand ring. Ring Size: O 1/2. Band Width: Tapers 6mm - 2mm.